Miss Derpy! I'm a pwnie of few words, so here she is....enjoy! MLP:FiM and Derpy Hooves is copyright Hasbro and Lauren Faust. Show them love and shower them in your derpy money accordingly. Derpy actually doesn't share the same mane as RainbowDash. at some points yes her mane does turn into RainbowDashs mane but it usually turns back into Derpys original hair style,and plus Derpy is original!! trust me I know what im talking about, I wouldn't argue about something I didn't know. Im not meaning to sound mean or anything I just thought I needed to point that out and to let you know. If you don't like it, make one up to your standards. I do vectors because I enjoy doing them, ..more for myself than to placate the delicate sensibilities of fine detail evangelists such as yourself. Sorry, but...I really can't seem to work up enough shivs to git. Best Deroy I have seen! I'm raising money for Toronto Sicks kids via Extra Life and my brony fans came through for me when I said I wanted to raise 500 bucks in 6 hours! When I lived in Toronto I used to Donate to TO Sick Kids and Sunnybrook Women's. Great hospitals that really need the support. I'm very honored that you've decided to base a tattoo off of one of my vectors! That's pretty sweet man. I totally want to see how it goes so please keep this thread updated and I'll be following your progress as well. I donated the day you linked me! And others should too... GO, DONATE AND GIVE YOU LURKERS!!! WOOOH!!! I LOVE HER SMILE! 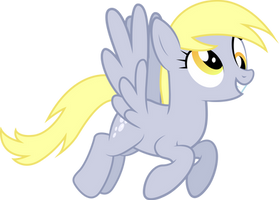 Nice, this pose fits Derpy rather well. AHHHHHH DERPY!!! I LOVE YU!! What's not to liek about her? !